Bharat Sanchar Nigam Limited (BSNL) is providing free subscription of Amazon Prime for the next one year to their postpaid and broadband customers. 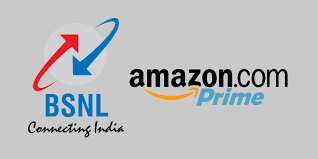 BSNL announcing their partnership with Amazon on Monday said that it will be offering Amazon Prime subscription which is worth Rs 999 for free to a select Postpaid and Broadband customers. this offer are - BSNL subscribers who are using postpaid plans which are worth Rs 399 or more and broadband customers who are using plans worth Rs 745 or more are eligible to avail the offer provided by BSNL. It will allow the customers to watch popular shows, movies and Amazon Prime Originals on Amazon’s Prime Video. The prime membership offered by Amazon also includes free shipping of its products with fast delivery service and will also give people the option to have access to deals on Amazon faster than others. 1. If you have BSNL postpaid plan worth Rs 399 you are good to go but if not then you need to upgrade your plan whereas on the broadband connection you need to have a plan worth Rs 745 or more. 2. Now you need to go to the BSNL website and tap on the ‘BSNL-Amazon offer. 3. Once you are done with the second step now you need to enter your BSNL number which will help you in generating an OTP. Now, use your Amazon credentials to avail the offer. 4. Finally, you just need to download the Prime Video App on your smart TV/ FireTV/ smartphone or go to the Amazon Prime Video site to start streaming.